A 42-year-old man with type II achalasia cardia underwent peroral endoscopic myotomy (POEM) by posterior approach. The procedure was started using a gastroscope fitted with a conical hood (DH-28GR, Fujifilm, Tokyo, Japan). 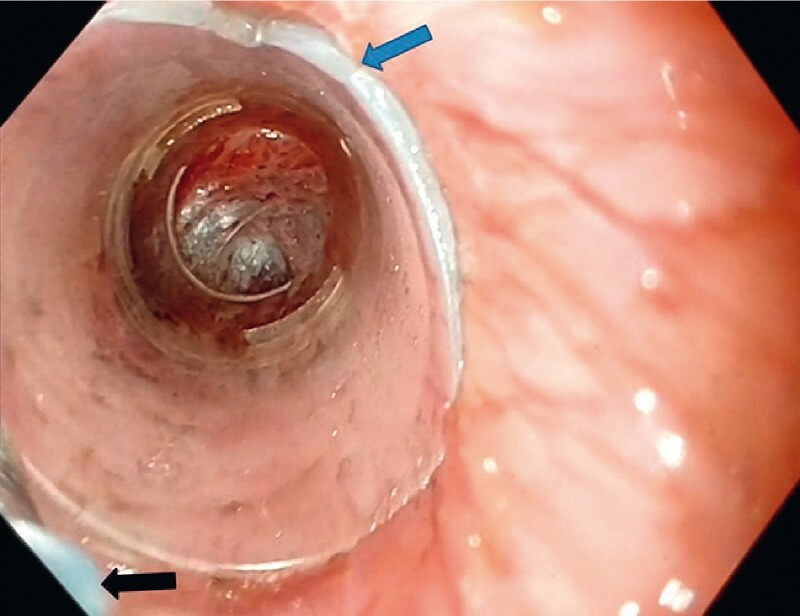 The gastroesophageal junction (GEJ) was tight when the scope reached the lower end during the creation of the submucosal tunnel. The scope was maneuvered to pass beyond the GEJ. However, the hood became stuck at the tight GEJ and slipped off the gastroscope. During an attempt to remove the hood using a rat-tooth forceps, one portion of the hood chipped off ([Fig. 1]). The hood was tightly stuck in the submucosal tunnel and the mucosa prolapsed inside the tunnel ([Fig. 2]). Forceful removal of the hood could have caused mucosal injury. Fig. 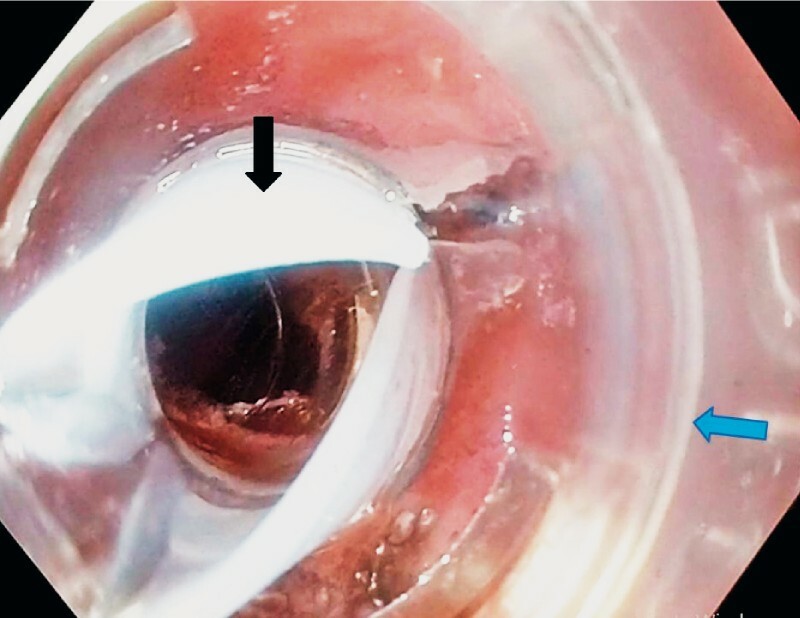 1 Dislodged hood in the submucosal tunnel, with a chipped margin (blue arrow) and the chipped-off segment (black arrow) with rat-tooth forceps. Fig. 2 Dislodged hood in the submucosal tunnel. a Mucosal prolapse around the hood into the submucosal tunnel (blue arrow), obstructing the removal of the dislodged hood. b Esophageal luminal view of the dislodged hood (blue arrow). We decided to proceed with myotomy to decrease the pressure in the submucosal tunnel and create more space. Myotomy was continued until we reached the hood and was carefully extended between the muscle and the hood ([Fig. 3]). The hood immediately became loose and was removed using a rat-tooth forceps ([Fig. 4], [Video 1]). The submucosal tunnel was extended beyond the GEJ and the myotomy was completed. The patient made an uneventful recovery. Fig. 3 Extension of myotomy between the muscle (black arrow) and the dislodged hood (blue arrow) in order to decrease the pressure in the submucosal tunnel. Fig. 4 Pulling the dislodged hood (black arrow) into the replacement hood (blue arrow) for safe removal. Video 1 Removal of the dislodged hood in the submucosal tunnel during peroral endoscopic myotomy. 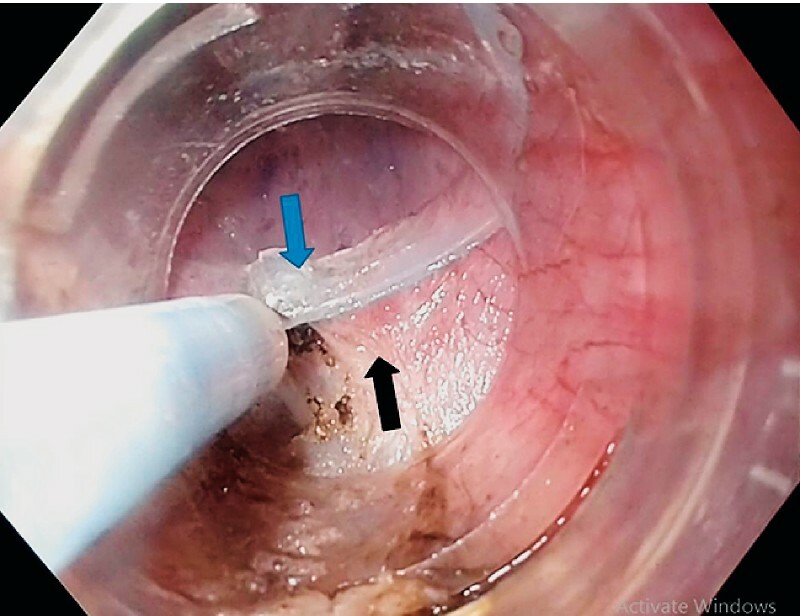 This case illustrates that the hood can become dislodged in the submucosal tunnel during POEM and can usually be removed easily . However, if it becomes difficult to remove the hood, as in the present case, myotomy should be carefully performed posteriorly to the hood, which should relieve the pressure in the tunnel and loosen the hood in the submucosal space. One should catch the hood from the mucosal side in order to avoid the prolapse of mucosa around the hood and to facilitate hood removal. Pulling the dislodged hood into the replacement hood will aid safe removal, as for the removal of a foreign body.